Happy New Year's Eve everyone! Amazing that today is the LAST day of 2013. This year was like a runaway car that never stopped for anything. I feel like I blinked and now it is gone. However, for me this is good because my husband will be home in less than 30 days from his deployment! That is very exciting for us and we are looking forward to 2014. I hope you are too! Well, I am back from my holiday travels today and I will confess that I am still on holiday time, not realizing that it is Tuesday and we are back with another Timeless Tuesday challenge. (Smack head here...) So, after unpacking, I quickly made my challenge card. We also are featuring our final December Guest Designer. This week we are happy to introduce Jessi Fogan! Her challenge is to create a shaker card. Fun fun!!! It has been a very long time since I made one of these so I was happy to do this. We hope you play along with us this week in this fun challenge for your chance to win! 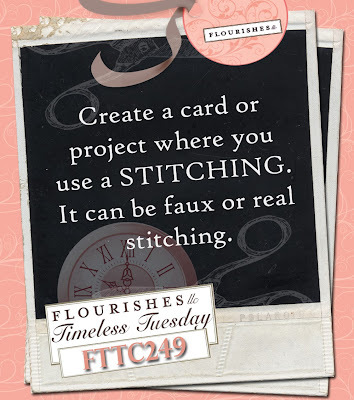 Be sure to stop by to check out and leave some love on the fabulous projects the Timeless Tuesday Team have created!! Have a fantastic New Year! I hope you all had a wonderful holiday and are able to get a little relaxation in. At least catching your breath from all the hub bub! I have a fun New Years card to share with you using Hambo's Newt and coordinating sentiment. This is sure to bring a smile to your recipient's face! I stamped Newt with Memento Black before coloring him with Copics. I then paper pieced his shirt using Echo Park's Reflections Fall collection for the patterned paper. The same paper was used on the top panel while the sentiment was stamped directly on the base of the card. Newt was then popped up. The card was finished with some MS twill ribbon, a button, and some twine jute cording. Here's to wishing you a fabulous and prosperous 2014! Thanks for stopping by! We hope you had a blessed holiday – however you celebrate! It was wonderful time to rest, relax and reflect on the beauty of the season surrounded by friends and family! We know some of you probably have some Christmas money that you’d love to spend and guess what? Flourishes needs to reduce what is on their shelves before our year-end inventory count. So, a sale is in order! Simply use the code MERRY13 in the coupon code box and you'll get 25% off your entire order -- even the Sale Page -- which already offers a discount on items listed there! All codes are case sensitive, so please use all caps, just like shown above. You have to act fast, this sale runs through December 30th. Another note to shoppers, Flourishes will be closing down the store for a few hours on the 31st in order to do inventory. For about a 4 hour period, folks will not be able to take or process orders. They promise they will try to be as quick as possible! Enjoy the rest of your holiday season -- 2014 will be here before you know it! WISHING YOU ALL MUCH LOVE AND JOY THIS SEASON FROM OUR FAMILY TO YOURS. Just a few more days until Christmas... are you all done with your shopping? I am pleased to say that I am and at my in-laws house in warm, sunny Florida to enjoy the holidays. For those of you in the path of these storms headed in your direction, and plan on traveling, I wish you all safe travels. Nothing like a storm before Christmas. 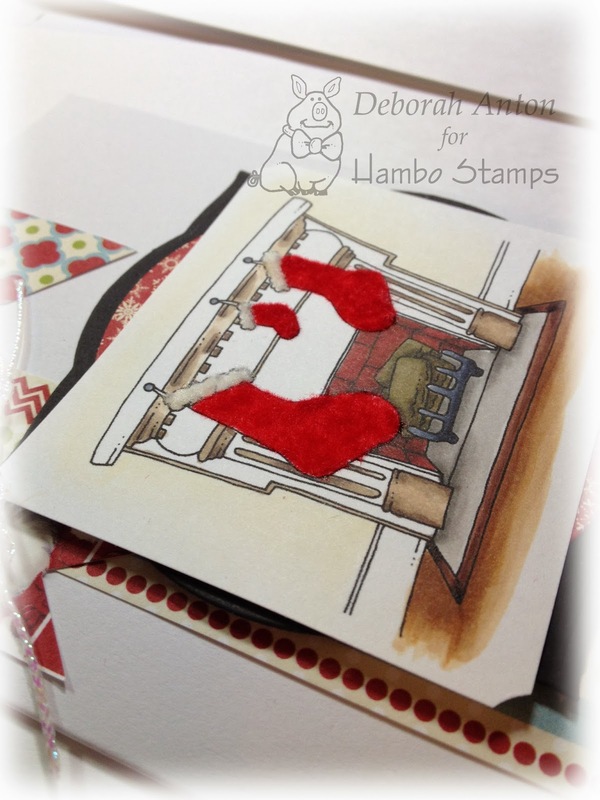 I wanted to share with you a card made with Hambo Stamps Fireplace Stockings. The image was layered over my nestie label and more patterned paper added to that. The patterned paper used is by Lilly Bee Design. The image was then popped up. I completed the card using some iridescent cording along with a light green button. A super fun image with many possibilities to create a fun scene. Thanks for stopping in today and I wish you all a wonderful holiday! It may be a little quiet around here, with just a few sporadic posts, but I will be back after the New Year. It's that time again and that means another Hambo Hoedown challenge! This time we are having you get a little "Kraft-y." That means to create a card or project using Kraft paper and one other color. I always love the look of Kraft and white. And it doesn't matter which shade of Kraft. I don't discriminate. :) For my card, this is more of a brown paper bag kraft. I used Penguin Snowball for my image made that my focal point on the card. He was colored in using some Copics and finished with some MS snowflake punches and buttons with twine. This card is going out to a friend of mine who's birthday is the same day as me. I sent her a gift, and forgot to add a card! So, this will come behind it and hopefully make up for my lack of thinking. I am off to pack for our holiday trip. How I do dread packing... but it's a necessary evil. Thanks for stopping in today and we sure hope you join us for this fun challenge. Be sure to check out the other Bacon Bits and the projects they created. Welcome friends to this weeks Timeless Tuesday challenge! We have another Guest Designer this week - Greta Hess! Greta is challenging to whip out an old favorite to be used on your card or project... Vellum! Vellum has many uses and I always love the look it gives to soften an image or look of a card. I thought it would be fun and nice to used last months release of Handmade Snowflakes to be the focal of the vellum. I used some blue cardstocks from the Color Made Easy collection of True Blues and some basic white. The white panel in the center was used to stamp the different snowflakes throughout using various hues of blue Memento ink in Danube Blue, Summer Sky, and Nautical Blue. I then layered some vellum over that and secured it with some metal brads. Some sheer and stitched ribbon was added along with a mini metal tag, which was photographed terribly! The tag says Happy Holiday and it almost looks greenish yellow. I stamped directly onto the vellum with some Staz On ink the sentiment and finished it with a few rhinestones to complete the look. 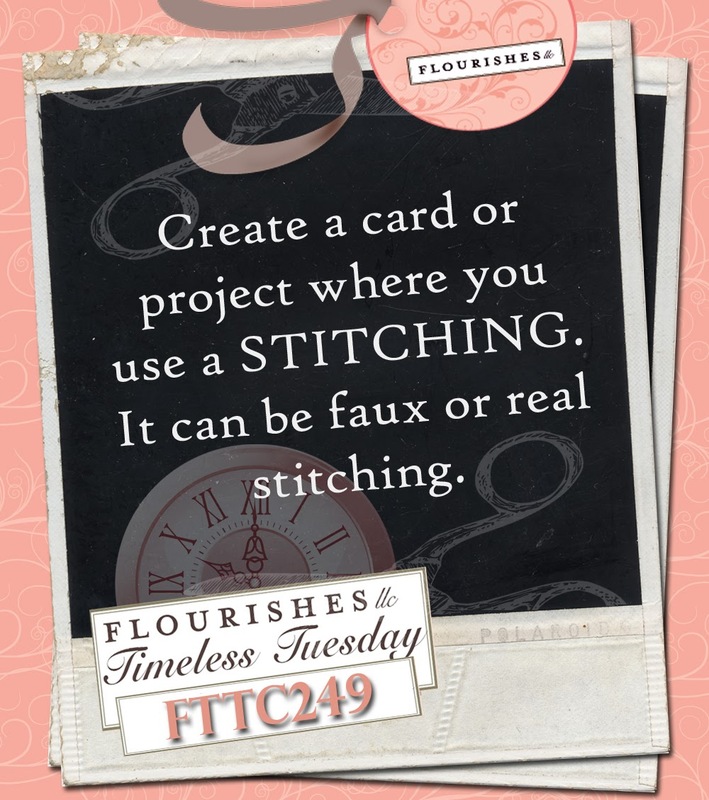 We hope you join us for this fun challenge but not before you head off to check out the other fabulous creations made by the Timeless Tuesday Team! I hope you all had a great week and now getting ready for a great weekend! For me, it will be a busy basketball day on this rainy day and guests for dinner tomorrow night. A full weekend, but I love it. I just wanted to share with you a quick card made with on of the new releases from Flourishes called Always Blooming. Another beautiful set and I used the now closed Flip It Sketch Challenge. The papers are from Theresa Collins Spring Fling collection while the card was finished off with a folded and tucked ribbon under the sentiment and some pearls. This sketch was so much fun and challenging at the same time. You can find my original card I made for the challenge here using a different stamp set. I hope you all had a great week and are ready for the weekend. And another week closer to Christmas! Today I would like to share with you an adorable digi image from Your Next Stamp's December release called Looking Chic. Isn't she adorable?! The image was printed on Neenah cardstock before coloring her in with Copics. I used this months YNS's sketch, but you can also choose the inspiration photo too! It's a fabulous challenge, so come on and play along for your chance to win! The patterned paper is from Theresa Collins Memories collection. The colors in this collection are so soft- I just love it. The image is popped up and the card was completed with some sheer ribbon and thin grosgrain behind the bow, topped with a rhinestone. Thank you for stopping by and hope you all have a wonderful weekend! Hello bloggers! Welcome to another Timeless Tuesday challenge. We all start to look forward at the end of the year and begin to make plans and goals and resolutions. 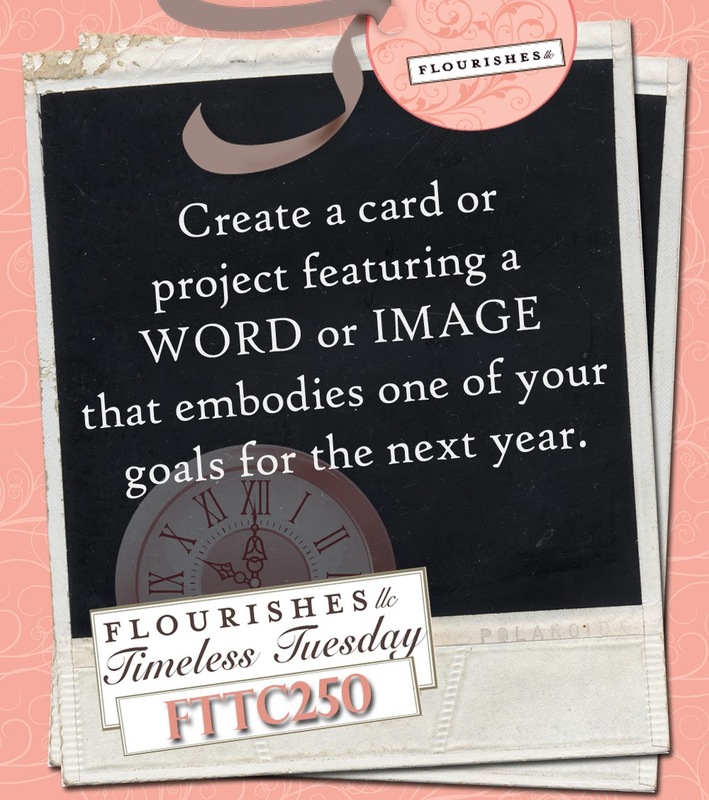 I would like everyone to make a card featuring a word or image that embodies one of their goals for the next year. For example, they may choose the word "Hope" if they are struggling with a chronic illness, or a picture of flowers if they would like to do some gardening. They could make a "Thank You" card, because they want to practice thankfulness, they could use a gingerbread cookie because they want to learn to cook, or they could make a Christmas card because they want to start on their Christmas shopping earlier next year. There are so many things to choose from!! I don't usually let things that are out of my control take over my life or make decisions for me, but recently, these words ring more true. The image of a butterfly is soothing, represents the amazing cycle of life, is quiet, and free. I will seek out more serenity in 2014. I used Flourishes set of Anemones for the sentiment and the butterfly from the recent release of Friendship and Flowers. The base is Flourishes Classic cardstock in Ivory followed by the layer of pink from Theresa Collins collection of Spring Fling. The top panel, if you will, is made of 9 medallions from my Spellbinders Fleur de Lis Rectangles set. I used my mini pop ups to raise them and stamped the sentiment on more Flourishes ivory cardstock with Memento Espresso Truffle. The sentiment panel is fishtailed and sponged with some pink chalk ink from Versa Magic. That too is popped up. The butterfly was stamped with more Memento Espresso Truffle and colored in with Copics, fussy cut and popped up. The look was completed with some Color Made Easy Baby Pink seam binding ribbon and jute twine. Simple and elegant was what I was going for. So, what is YOUR inspiration for next year? We'd love to have you play along and share that inspiration. Thanks for stopping by and be sure to check out what inspires the Timeless Tuesday team! Yes, it has found us again. But I will continue to look for Friday. How about you? Have you seen the latest challenge over at the Hambo Hoedown? It is a fun one and one that can easily be done! Bookmarks! And if you are looking for one that is unique and will make that someone laugh, look no further and take a peek here at Hambo Stamps bookmark disclaimer. I have decided to get a little creative with this disclaimer and another image called Big Giraffe and combined them so that the giraffe will be sticking out from the book. I printed out the bookmark disclaimer on some Neenah cardstock and then stamped the image where I wanted it by covering up the area I didn't want with a post it note. I colored in the image with my Copics and then fussy cut around the giraffe. Then I placed it over some chocolate chip SU! cardstock and fussy cut around the image again. The patterned paper from Cosmo Cricket is the base before layering the image and disclaimer over it, finished with some ric rack ribbon. Thanks for popping in and hope you have a wonderful start of the week! This is my last post as the Guest Designer for The Stamp Simply Ribbon Store. I truly enjoyed every moment creating for Sharon with some of the beautiful products she carries in her store. Thank you so much Sharon for having me and sharing my creations. 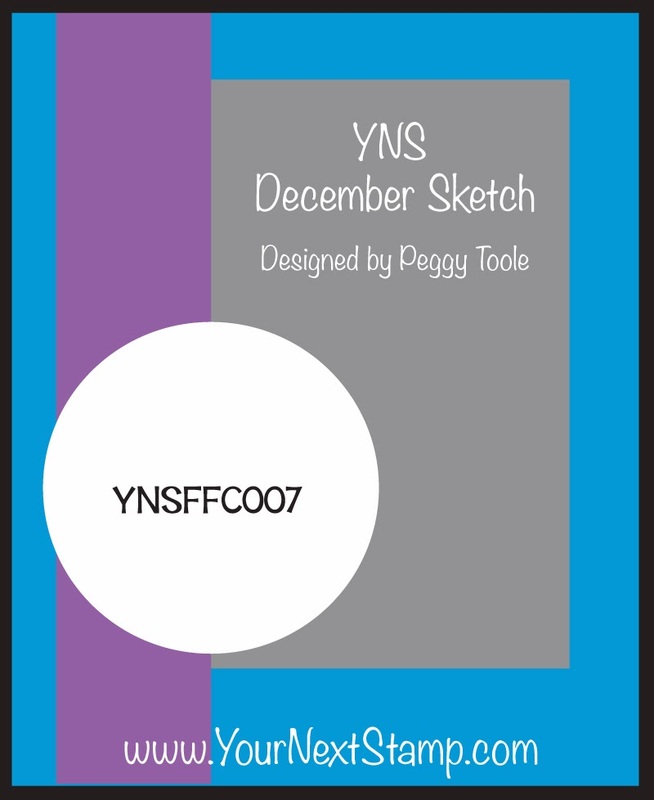 My final project are some tags I created using more the Anna Griffin collection of Yuletide Greetings. This collection is just so beautiful and elegant. I can't wait to add these tags to some gifts this year. For this first tag, I used Spellbinders Fleur de Lis Rectangles to cut out the heavyweight cardstock for the base. I then layered the center with some of the Yuletide patterned paper and used the coordinating 3-D Yuletide sentiment stickers for the main focal image. The tag was completed with some Lipstick Red seam binding ribbon and gold beaded cording I had. I used some jute twine cord for the hanger. Using Spellbinders Radiant Rectangles, I made one of the patterned papers the base of the tag. (By the way, if you have never used Anna Griffin paper pads, they are wonderful in terms of stiffness. They are a perfect weight to use as a base, like I did here, and for layering on a card.) Using another die from the Radiant Rectangles collection, I cut out the oval and ornate center, which I layered and popped up using some Therm-o-web foam squares. 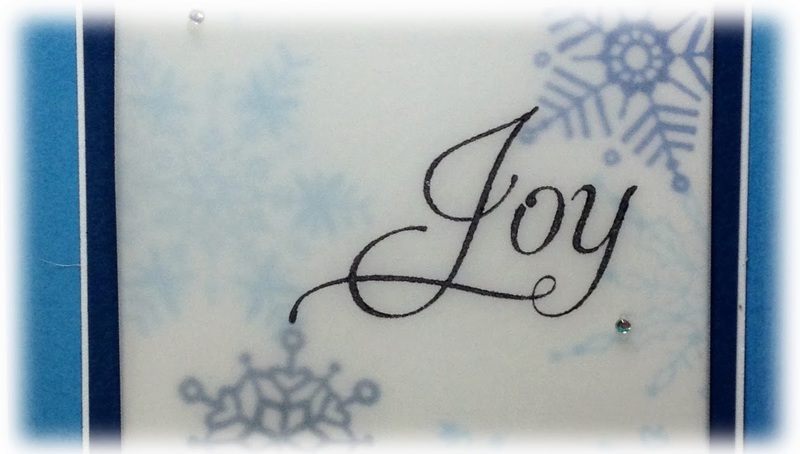 I then finished it with the Yuletide 3-D sentiment stickers and some Kaisercraft rhinestones. I then added a bow using some Moss seam binding ribbon. Again, Jute twine cord for the hanger. I used the 3-D Art stickers for this tag to be the focal point. I cut the base out with my Spellbinders Fleur de Lis Rectangles and a piece of the patterned paper with my Spellbinders circles. I added the 3-D art sticker and some seam binding ribbon in cream, which I doubled bowed, wet, and dried with the heat gun, before finishing it with a button, beaded cord, and jute cording. The hanger on this tag was more of the gold beaded cord. Hopefully I was able to inspire you to make some fun and easy tags to add to your gifts this year. Be sure to check out The Stamp Simply Ribbon Store for this collection and new collections Sharon offers. Her inventory is wonderful! Thanks for stopping by and taking a look! Welcome to the kick-off of our December releases! Today two of the Flourishes Design Teams are ushering in a challenge and YOU could walk away winning all of our new sets for December! Here’s how to get in on the fun. All you need to do is play in the…..Flip it Sketch Challenge! Simply create a card or project inspired by either of the sketches above. Please DO NOT combine challenges from other sites or locations. Only those entries that don’t combine will be in the running. Because this challenge means winning new Flourishes sets we want to see your beautiful creations made specifically for this challenge. We’ll announce the winners on Saturday in our Winner’s Circle Post here on the blog on Saturday December 14th, so check back then to find out if you are a winner! Using Flourishes classic cardstock in Ivory for the base and some Echo Park's Reflections - Fall collection for the patterned paper. I used Flourishes Color Made Easy Tonal Neutrals cardstock to layer and mat with the patterned paper. Using the cup design, I stamped it and colored it in with my Copics with E81, E84, W0, W1, and W4. The image in the center of the sleeve was stamped in with my Sepia Versafine ink. The card was completed by stamping the sentiment in Memento Espresso Truffle fishtailed under the coffee beans using my circle punches to punch it out. And finally, I embossed the 'Coffee' sentiment at the top with my detail white ep, being sure not to worry about the little bits left behind. I even used my white gel pen to dot a few bits throughout. The look was completed with two pearls. Today is a fun new challenge over at the Hambo Hoedown! The challenge is bookmarks. How fun is that?! I haven't made a bookmark for a while and this was fun to do. Even better is the Bookmark Disclaimer sentiment from Hambo Stamps for this bookmark that made it even more fun! Kraft cardstock was used for the base and I used some dp from MME while cutting out the sentiment with one of MFT dies. I completed the bookmark with some canvas ribbon from The Stamp Simply Ribbon Store and some Prima flowers. Super easy and fun to make. I will certainly be making more bookmarks in the future! Thanks for taking a peek and be sure to peek at the other fabulous bookmarks the Bacon Bits have done! They are all amazing! This month, we have some guest designers joining us to share some challenges with you and play in on the fun. Today is our first guest designer - Kerin Sylvester! Welcome Kerin! So, what does she have in store for you for a challenge? Stitches! I love sewing on cards, but I will admit I am not very good at it. I will just blame my machine though... hahaha! Some classes or lessons are certainly needed I think. So if you don't look too closely, this creation should pass the challenge. For my card, I used this months new release of Friendship & Flowers. The image was fussy cut out and popped up over the Flourishes Classic black cardstock which I sewed around the edges and sewed through the strips of patterned paper from Anna Griffins Yuletide Greetings collection. I then stamped and colored in the butterfly to be popped up as well after stamping the sentiment with Versamark ink and using my detail white embossing powder to be heated and embossed. The card was finished off with some pale green and pink pearls. I really like the striking colors against the black and felt it made this flower pop. Thanks so much for stopping in! Be sure to check out the other beautiful designs made from the Timeless Tuesday team.